If you’re considering ‘invisible’ braces you probably have a lot of questions. Here we try to answer some of the most common ones including how invisible braces work, the benefits and drawbacks of invisible braces, and the cost of Invisalign braces. Traditional metal or ceramic style braces are fixed to your teeth using brackets. Invisalign works in a completely different way. It uses series of clear aligners to gradually move your teeth.Not only are these clear aligners discrete, they are also more comfortable and removable. 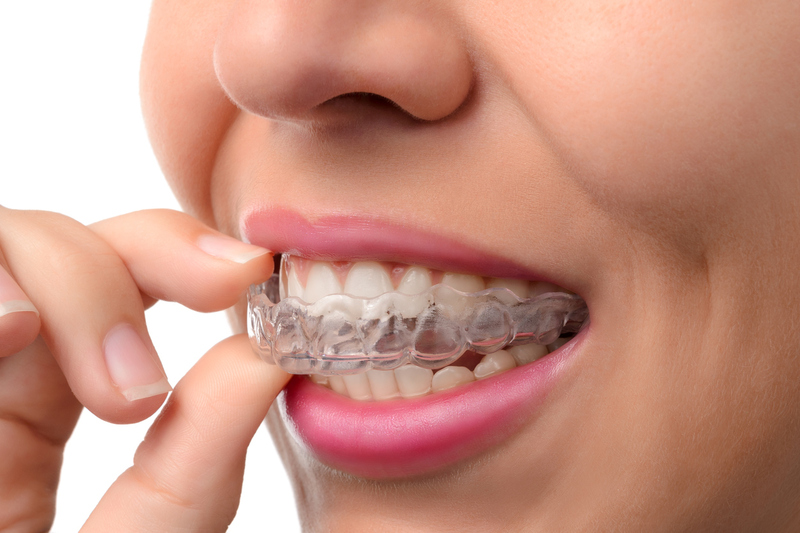 The aligners are replaced every 1 - 2 weeks so that with each tray your teeth are a little bit straighter. Each aligner is carefully crafted just for you using state-of-the-art 3D technology. With this technology we can create the most accurate treatment plan and even show you how your teeth will look at the end of your treatment. Treatment with invisible braces can take anywhere from 12 to 18 months. You’ll need to see your dentist every 4 – 8 weeks during this time so they can check on how your teeth are doing and to order your next sets of aligners. For most patients the biggest benefit of Invisalign braces is that they are more discreet than traditional braces. Most people won’t even notice you are wearing them. Invisalign braces are also removable, which means you can take them out if you have an important meeting or social event to go to. You need to wear them for 20 – 22 hours a day, but for many people having this option is a major benefit. There are also no eating restrictions as there are with traditional braces because you remove them when you eat. Most patients find invisible braces are also more comfortable than traditional braces. The metal wires and brackets of traditional braces can cause sores in your mouth and the adjustments can be painful. Invisalign braces aren’t right for everyone. Certain types of corrections may not be suitable for invisible braces, such as teeth that need to be moved vertically or rotated.But it’s important to talk to your dentist to determine if you are a good candidate. When you first start using Invisalign braces you may find your speech is affected, but this will go away over time. Some patients find it difficult to wear them for the necessary time each day. They are also more expensive than traditional braces. Unfortunately, invisible braces are not available on the NHS, so will have to be covered by your dental insurance or paid for privately. Children can usually get metal braces on the NHS, but adults will have to pay for any orthodontics privately. The cost of Invisalign braces will vary depending on your treatment plan. As a rough estimate, you’ll pay between £2,500 and £5,500 for Invisalign braces. The more complex and lengthy your treatment, the more expensive it will be. Costs also vary among dentists depending on their experience and location. If you’re interested in finding out more about whether Invisalign braces are right for you or your teen, give us a call today to set up a consultation. We offer the full range of Invisalign braces including Invisalign Full, Teen and Lite, and will choose the best product for your particular needs. We’re happy to answer any questions you have and look forward to exploring how we can help you to get the smile you’ve always wanted. Ready To Find Out More about Invisalign invisible braces?